This stupendous drawing shows a Karloffian Monster with rotting flesh and pulsating veins, its massive head held together with crude sutures, screwed-in metal clamps and plumbing. The piece was done in 1992 for a proposed but unreleased bubble-gum card set. The eye-gouging, brain-frying lowbrow art of Chet Darmstaedter, the enigmatic artist known as XNO, evokes Weird-Ohs, Big Daddy Ed Roth, and Basil Wolverton on crack. A prolific contributor to the underground scene of the 80s and 90s, XNO took his gloriously gory art to the mainstream with Topps’ memorable Dinosaurs Attack! Series of 1988, painting 43 of the 54 cards in the set. 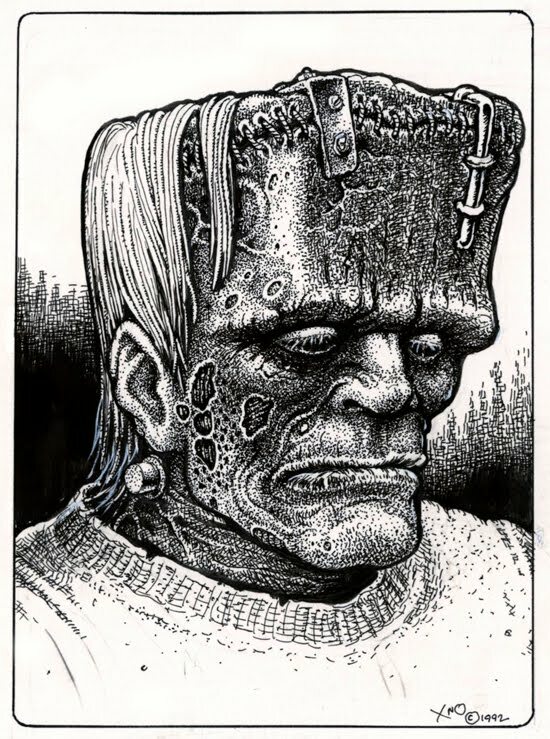 Frankenstein’s Monster is a favorite subject of the artist, given a toxic green complexion and often pictured in a woolen vest and chains, seen driving the Munsters coach or mingling with a cast of classic monsters, and often sharing the canvas with his bandaged Bride — sometimes depicted in images meant only for adults accompanied by grown-ups. XNO also paints Frankenstein derivatives like the high-flying Frankenstein Jr. and Milton The Monster. 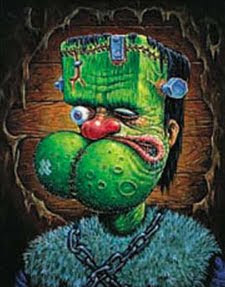 His Frank’n’pop character mashes The Monster with Popeye. 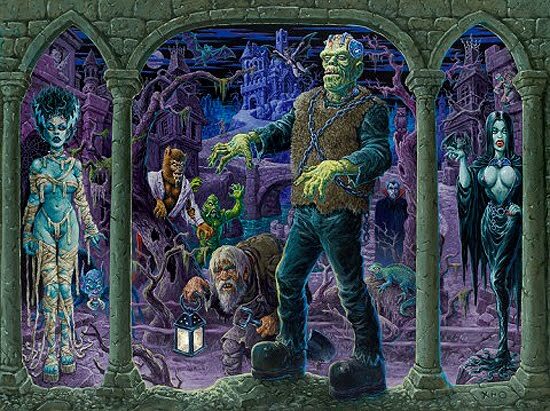 What the world needs now is an XNO art book — with a large Frankenstein section, of course. XNO paintings on the Copro Gallery site. Another XNO gallery on the dormant Lowbrow Artworld site. Love this artist's style. Reminds me of Basil Volverton. First saw XNO's work around '83 or so and have been following his stuff ever since. A friend of mine had a great unpublished painting of his that he sold without letting me know. I'm still pissed.